FILE - A man works at the site of the Thilawa Special Economic Zone (SEZ) project at Thilawa, Myanmar, May 8, 2015. The U.S. decision to lift trade sanctions against Myanmar has been welcomed by local economists and businessmen, who say it will remove a major constraint on international trade with the impoverished country and boost growth across its economy. Political analysts and activists said the decision also puts a greater responsibility on the National League for Democracy (NLD) government to make sure “crony” businessmen improve their practices, which have often involved allegations of corruption, land grabs, illegal logging, and the drug trade. After consulting State Counselor Aung San Suu Kyi during her U.S. visit last week, President Barack Obama announced he would soon end executive sanctions. This will remove more than 100 businessmen tied to the former military regime from a U.S. Treasury blacklist and lift restrictions on Myanmar’s jade and gemstone industry. The decision also ends the State Department’s special reporting requirements for American investors. Additionally, the U.S. granted Myanmar greater access to its market by listing the country in the General System of Preferences. The 20-year-old sanctions prevented American firms and foreign investors using U.S. financial services from having any dealings with the tycoons, whose conglomerates dominate Myanmar’s economy through trade, banking, extractive industries, agro-farming, tourism and airlines. The legal hurdles deterred many potential foreign investors from entering Asia’s last frontier market, while also tainting Myanmar exports to America. Maung Maung, an economist with the Ministry of Commerce, said the decision would help all sorts of exporters access the American market and end difficulties for local businesses trying to use international financial services. The $1.65-billion garment industry is one labor-intensive sector that could benefit, he said, adding, “If we develop the garment sector we can create a lot of employment.” The industry is growing rapidly, but U.S. exports make up less than 10 percent—down from 65 percent before sanctions hit. 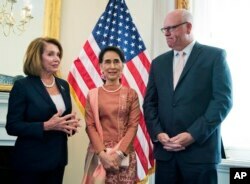 FILE - Myanmar leader Aung San Suu Kyi, center, meets House Minority Leader Nancy Pelosi of Calif.. and Rep. Joseph Crowley, D-N.Y., on Capitol Hill in Washington, Sept. 15, 2016. Sean Turnell, an economics professor at Sydney's Macquarie University and an adviser to Aung San Suu Kyi, said the end of sanctions opens the door to more U.S. investors with high standards in business operations and corporate responsibility. Sanctions have already eased some in recent years, but U.S.-Myanmar trade remains small at a reported $225 million last year, while U.S. investment was a mere 0.2 percent of $9.4 billion in foreign direct investment, according to Commerce Ministry figures. Japanese, Singaporean and South Korean investment has meanwhile surged ahead. China has long been Myanmar’s dominant investor and trade partner. Can the NLD reform ‘cronies’? U.S. sanctions were meant to pressure the military and its business associates into supporting Myanmar’s democratic and economic reforms, but the NLD government now says lifting sanctions will help spread the transition’s economic development benefits across society. Human Rights Watch, nonetheless, slammed the decision, saying it removed political leverage over the still-powerful army while reforms remain incomplete. Political analyst Yan Myo Htein said local tycoons would greatly benefit from the decision, adding that the NLD government should find a strategy to limit their control over the economy and improve their businesses, but might struggle to do so. “Myanmar is not ready to accommodate the total lifting of sanctions. Cronyism in business here is very high, that’s why if the U.S. government lifts all the sanctions that will only benefit the cronies,” he said. Turnell, the NLD advisor, acknowledged the government will have to meet this challenge. “Obviously there are still issues to do with previous-sanctioned entities and individuals, for which, again, local policies can and will be crafted to deal with,” he said. FILE - Myanmar's State Counselor Aung San Suu Kyi (C) holds talks with leaders from the United Nationalities Federal Council (UNFC) at the National Reconciliation and Peace Centre (NRPC) in Yangon, July 17, 2016. Also open for U.S. business is the murky jade industry in conflict-torn Kachin State - estimated to be worth up to $31 billion in 2014, almost half of Myanmar’s GDP. Control over the mines is a root cause for the Kachin rebellion, as relatives of former junta leader Than Shwe, other ex-generals and cronies, and an ethnic Wa drug lord secretly run much of the sector and locals see no benefits, according to a Global Witness investigation. The London-based resource corruption watchdog said removing sanctions on jade meant the NLD government will lose an important tool to push for reforms. In July, the government started reform attempts by imposing a mining license moratorium until new legislation on jade is passed. “Instead of treating sanctions as a giant ‘on-off’ switch, the U.S. should have linked the removal of sanctions to benchmarks on transparency and reform being met,” Juman Kubba, a senior campaigner at Global Witness, told VOA.